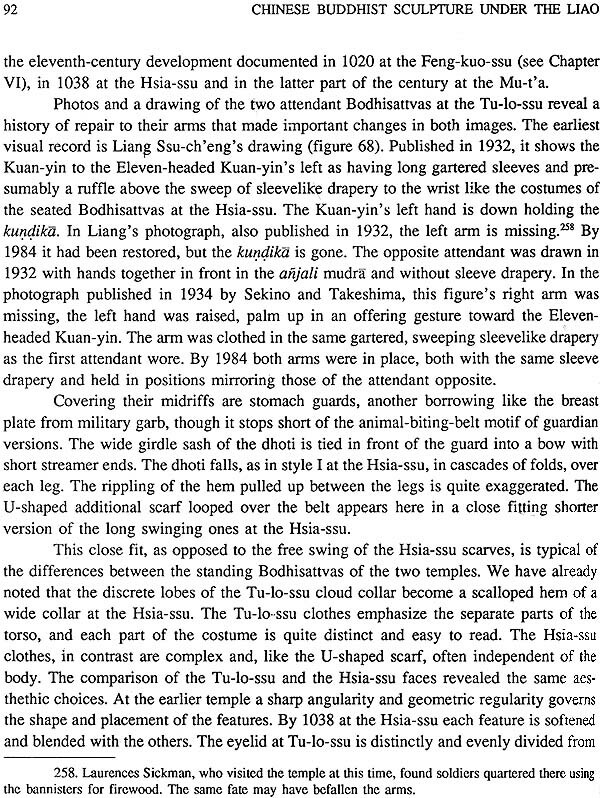 A study of the Chinese Buddhist sculptures of the Liao dynasty (907- 1125), both those in situ as well as those in public collections. They are of the greatest importance as resources for the study of a large number of sculptures in the USA, Europe and Asia. 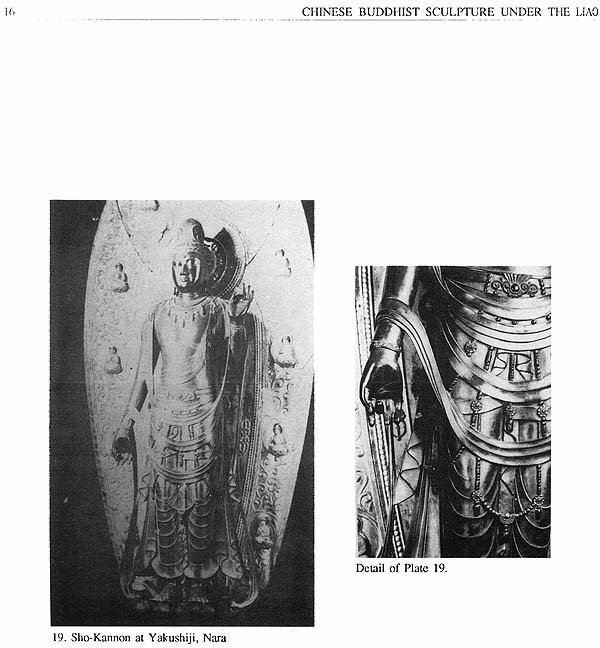 They have been thoroughly examined by Prof. Marilyn Leidig Gridley for charting the development of style, iconography and patronage during a vital period of Buddhist activity in north China. The Liao sculptures provide important correctives to many generalizations about Buddhist art in China during these centuries. They make it clear, for instance, that the midninth century persecution did not spell the end of the mainstream of Buddhist art of Tang China. The second chapter is a historical background of the Liao emperors, their attitude toward and patronage of art, which is primarily Buddhist art. The 13-storey octagonal Ta t'a or Great Pagoda is the most massive Liao structure extant, 264 feet high. It is a valuable reference point for style and iconography. The Preservation of Sutras Hall built by Hsing-tsung in 1038 to house 579 volumes of the Tripitaka, has 29 original statues on its altar and is the single most important source for the study of Liao sculptures. 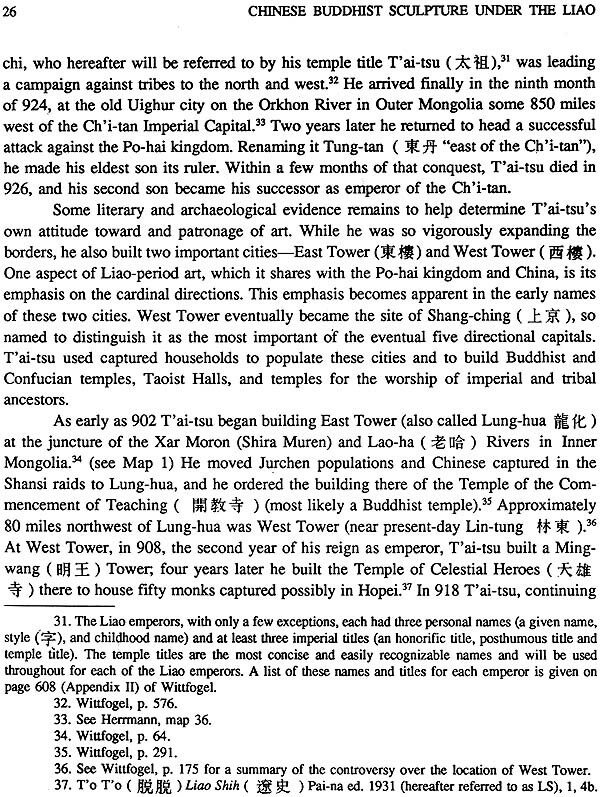 The third chapter details the three major monuments in the environs of Ta-t'ung in Shansi Province, the site of the western capital of Liao. The three monuments are the Hsia-ssu (Hsia Hua- yen-ssu or Lesser Avatarnsaka monastery), Shih-chia-t'a and Liao sculptures in Yun-kang caves III and XI. The identification of the clay sculptures of Hsia-ssu has been discussed at length, besides the stylistic features of their crowns, costumes, haloes and jewelry. The cloud collar (yun.-chien) as a distinctive feature of imperial dress in the Liao period, seen on the seated Bodhisattvas, has been treated at length. The second Mu-t'a pagoda is a sculptural mandala from the end of the 11th century. It is the earliest extant wooden (mu) pagoda (I' a) in China. The first floor is dedicated to Slikyamuni, the third to the four Buddhas of the Vajradhatu-mndala, the fourth again to Sakyamuni, the fifth to Eight Bodhisattvas around the central Buddha, Vairocana in the mudra of knowledge fist. A close analysis of their style supports a date of late 11th to early 12th century. The Liao emperors repaired and expanded the cave temples of Yun-kang. The overall impression of Liao sculptures is one of softness with no bone structure. The popularity of the cloud collar is one aspect of a large effort to emphasise ties of the divinity and this world. The parted lips, the sparkling eyes, the trembling ornaments infuse the sculptures with the pulse of life. The austere styles and iconography of early Buddhist art were tempered by emphasis on the human element. The fourth chapter deals with sculptures in the Tu-lo-ssu monastery, that date from 984. 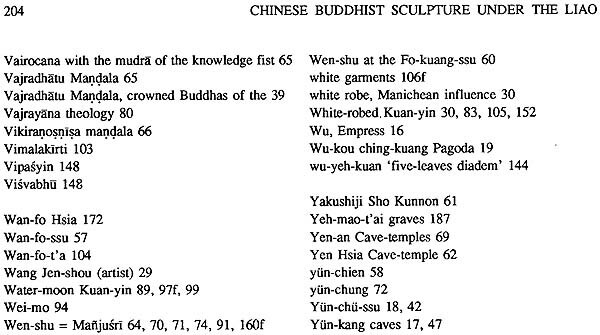 The Kuan-yin at the back of the altar is the single most important statue to this study. He is flanked by two small guardian kings dressed in full armor. 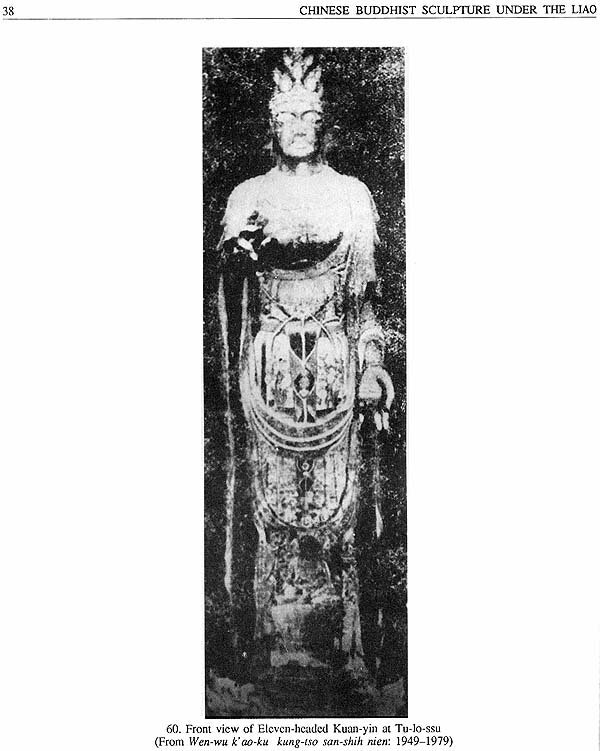 It is an extensive study of the evolution of Avalokitesvara in general, besides that of the Water-Moon Kuan-yin and of his other forms. 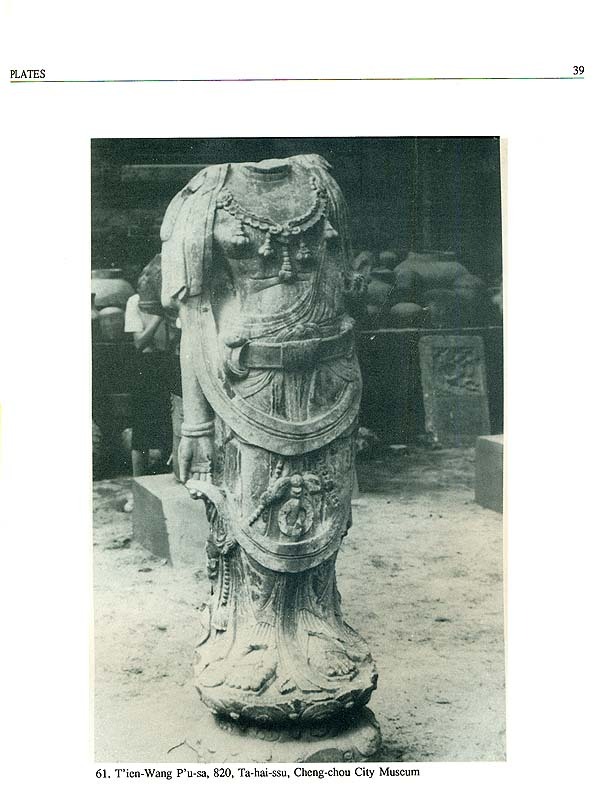 The style and iconography of the Tu-lo-ssu sculptures leads to Sri Lanka, SE India, Turfan, Tun-huang, and of course to Japan. The life-size ceramic Lohans or Arhats in the Hsi-ling mountains reveal the high level of technical and artistic excellence in Liao portraiture. The sixth chapter treats of 23 clay sculptures on the altar of the Feng-kuo- ssu monastery, that date from 1030. The enormous size of these Buddhas and the Shang-ching Kuan-yin show distinctive stylistic components. Certain motifs and iconography take us to Pala art, to Mai-chi-shan in Kansu, and to Sokkur-am in Korea, but all the inspirations were synthesised into a new statement. 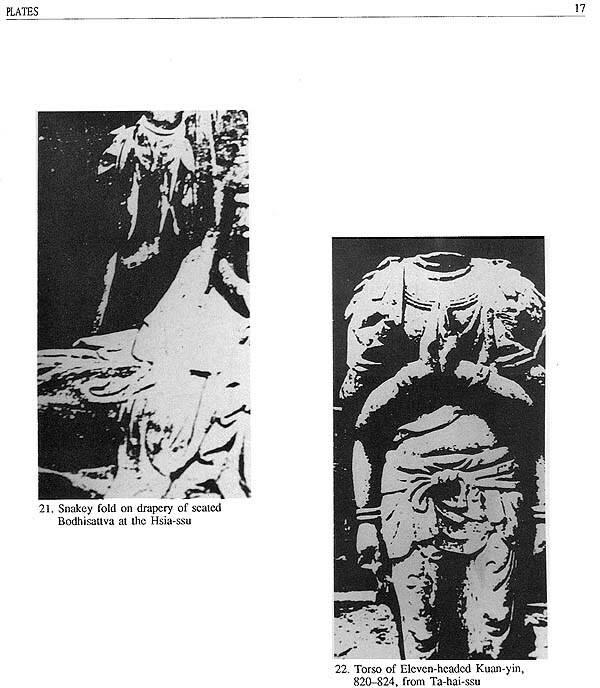 The seventh chapter analyses sculptures in public collections, like the Sickman collection at the Nelson- Atkins Museum of Art. The book ends with a conclusion, bibliography, chronology and 178 plates. It is a rich and revealing analysis of the major changes in Liao art that evolved from T'ang tradition, enriched by newly arrived inspirations from South India and Central Asia. The vigorous evolving art form of the Liao period is a continuation of the great tradition of Chinese Buddhist art. Dr. Marilyn Gridley is presently teaching at the Department of Art & Art History, College of Arts and Sciences, University of Missouri- Kansas City. In the north of China today over seventy free-standing Buddhist sculptures dating from the Liao Dynasty (907-1125) remain in place in their original temple hall or pagoda. They are of the greatest importance as a resource for the study of a large number of sculptures from that period now in collections in this country, Europe and Asia. In spite of their obvious importance, the sculptures in collections and in situ have never been subjected to a thorough examination for the purpose of charting the development of style, iconography, and patronage during a vital period of Buddhist activity in the North. 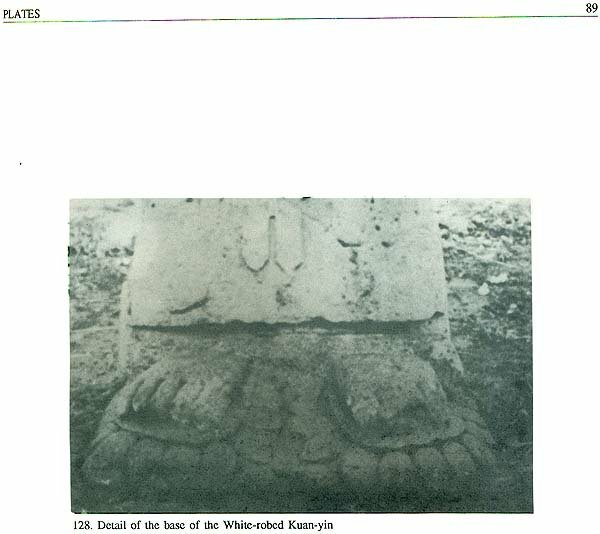 It is the purpose of this study to focus on these sculptures in situ and selected examples in public collections to analyze the development of their style and iconography and to determine as much as possible the factors which influenced that development. The "place" of the Liao sculptures also figures in their neglect. They are in territory in the north of China that was controlled from the tenth to the fourteenth century by a series of barbarian dynasties. The first of these, the Liao, established by a Ch'i-tan tribal leader in 907, was overthrown in 1125 by the Jurchen who established the Chin Dynasty. They, in turn, were overthrown by the Mongols in 1234. 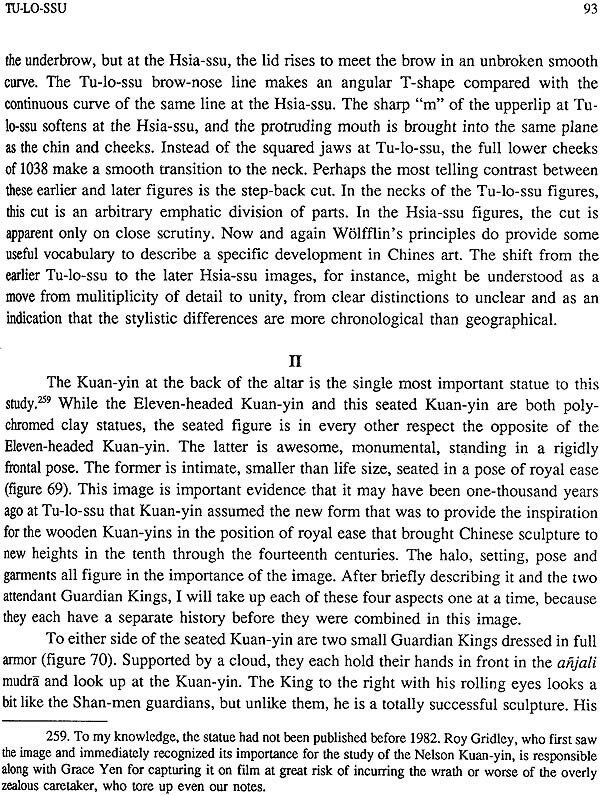 Gustav Ecke's assessment in 1948 of the Ch'i-tan character makes it clear how prejudicial the barbarian connection is: "No acculturation changed the Khitan into Chinese, no layers of varnish could hide their Tung Hu character, .Their temperament was akin to that of their younger Mongol relatives.?' 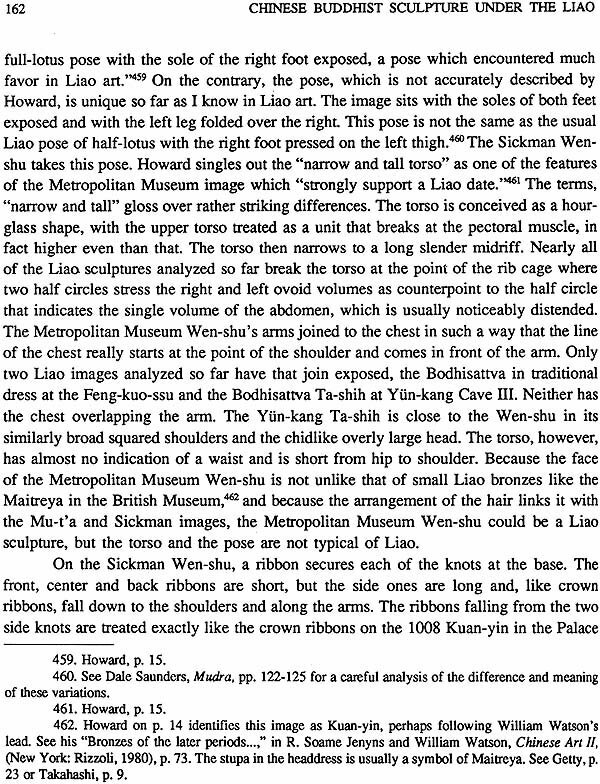 It is this kind of assessment of the Liao that has led, I believe, to the neglect of a major period in the history of Chinese sculpture. 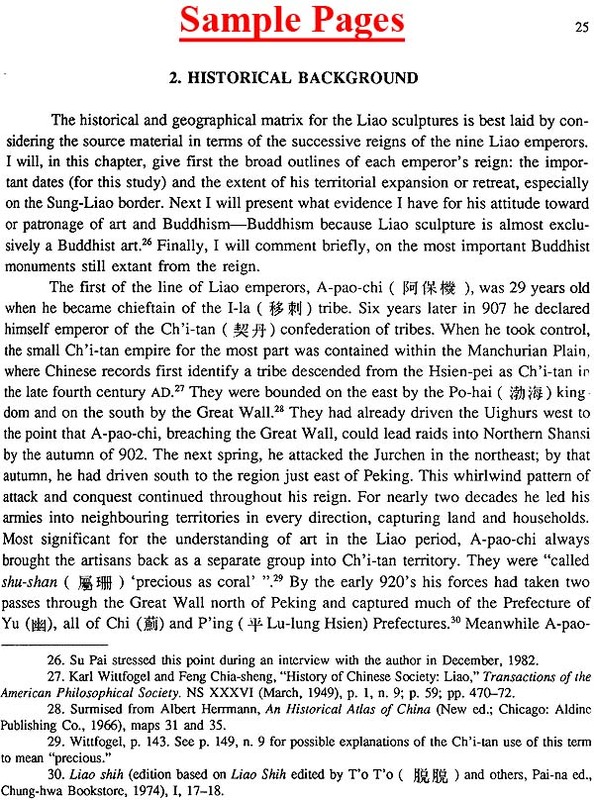 The pronouncement that the Liao were inveterate barbarians has tainted the art associated with their patronage. To confirm his conviction that the Ch 'i-tans, even the rulers, were hopelessly coarse and vulgar, Ecke chooses as his example the one Liao emperor whose dissolute character was notorious. But the others, to a man, strove to appropriate Chinese values. As the following chapter will show, the Liao emperors of the eleventh century achieved a high level of culture and sophistication. They valued their own cultural heritage but greatly admired and tried to preserve and assimilate the culture they had conquered. Consequently, the Buddhist monuments built under their patronage are of the highest quality, long admired for their architecture, and equally admirable for their sculpture. 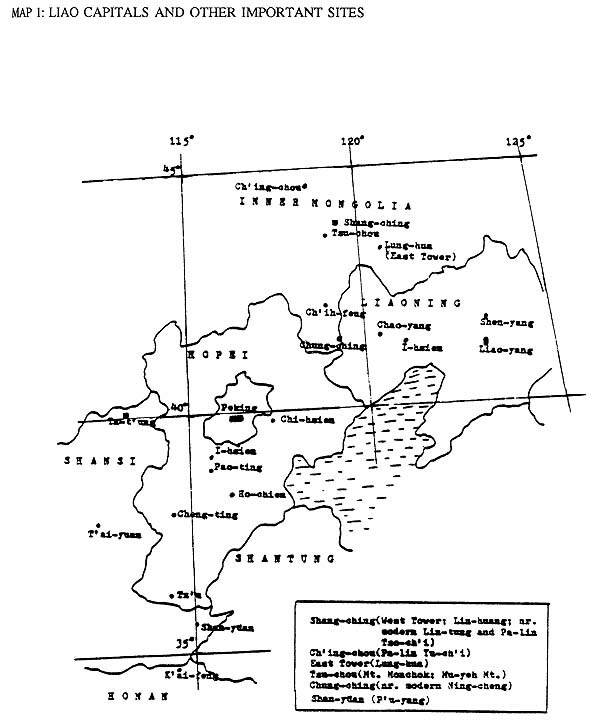 The Liao occupied territories with long-standing Chinese Buddhist communities which the Liao emperors supplied with generous, even lavish patronage. They enthusiastically funded renewed activity at Buddhist sites like the Yun-kang Caves at Ta-t'ung and the surra-carving project at Fang Shan southwest of Peking. In all of this activity, the Ch'i-tans were the patrons, not the artisans. Literary sources provide evidence that it was captured Chinese artisans who accomplished the design and construction of the monuments. The Ch'i-tan patronage, of course, affected the choice of iconography and the location of the sculptures, but the style, technique and aesthetic, particularly in monuments closest to the border, are Chinese. Even deep within the Liao domain, imported and transplanted Chinese populations, especially artisans, produced monuments entirely worthy of the tradition they brought with them. The title of the present study, "Chinese Sculpture under the Liao" stresses one of the main emphases of the present investigation: the free-standing sculptures are an integral part of the Chinese tradition. They are an invaluable resource for the study of developments in Chinese Buddhist art and philosophy during the tenth and eleventh centuries. 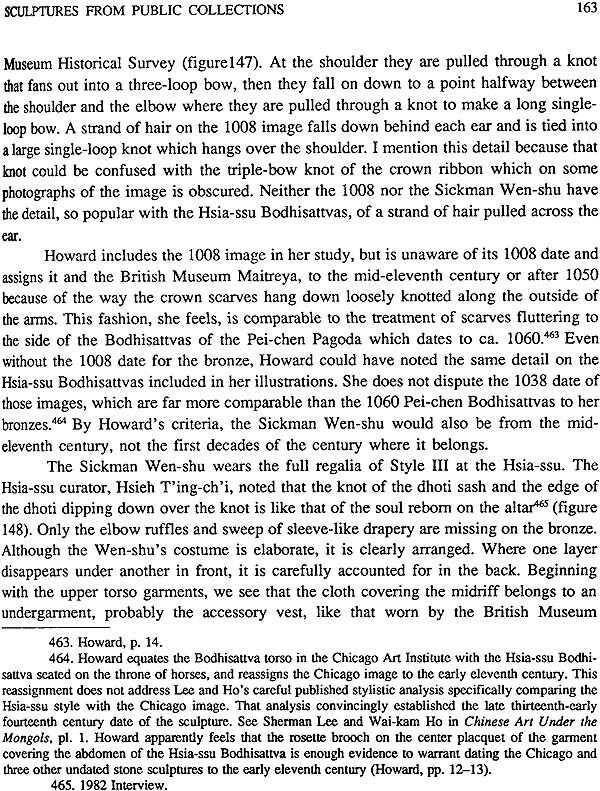 Ecke links the Chi-tan with "their younger Mongol relatives," and this association continues in scholarship today as a mixed blessing. In the burst of activity since the 1960's in scholarship of the arts of the Yuan period, Liao arts have come under scrutiny as precursors to the Yuan. Much benefit is to be gained from considering the cultural common denominators of the Liao, Chin, and Yuan conquerors. They came from the same region and had many of the same cultural traditions and contacts. 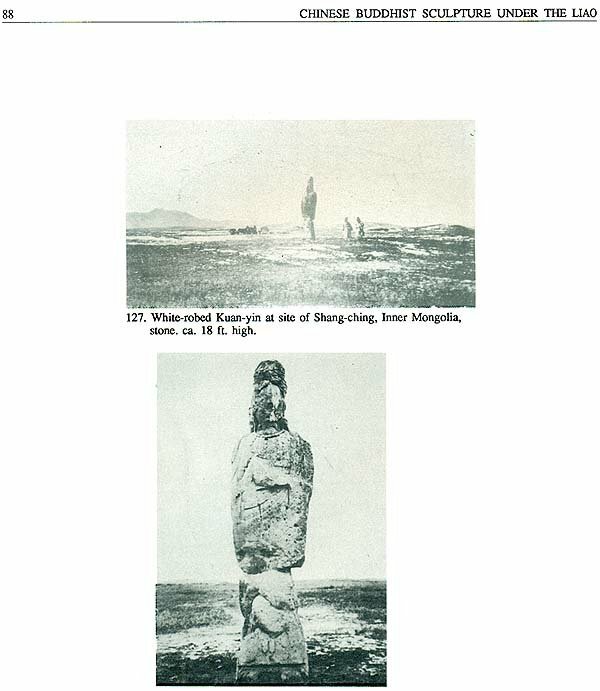 The 1968 exhibition of Chinese Art Under the Mongols is the most important study to date that approaches Liao sculpture from that standpoint.' It is, however, as successor to T'ang rather than as precursor to Yuan that the greater significance of Liao sculpture lies. The Buddhist art produced in the time and territory of the Liao emperors is distinct from that produced during the Yuan Dynasty when Lamaist Buddhism became the dominant tradition. The imposition of the Lamaist pantheon drastically changed the course of Chinese Buddhist art. 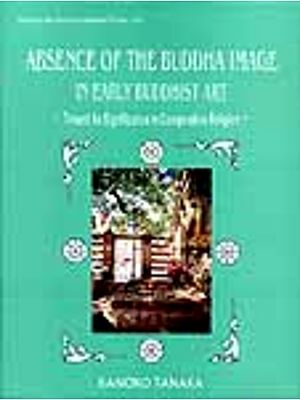 New studies of Lamaist and tantric art in general have increased the appreciation of that art. It is no longer deprecated as spelling the end of creativity in Buddhist art in China. Liao art, however, develops clearly and logically out of the T'ang tradition and has little or nothing to do with Lamaist art." Yuan Buddhism breaks with both the T'ang tradition and the Liao expression of it.